Went south to get some sandwiches. 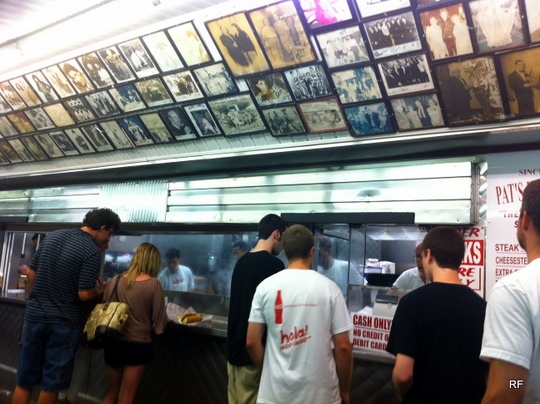 As a first timer, we had to hit the tourist spots: Geno’s & Pat’s. Little did I realize they were right across the street from each other, next to a park. 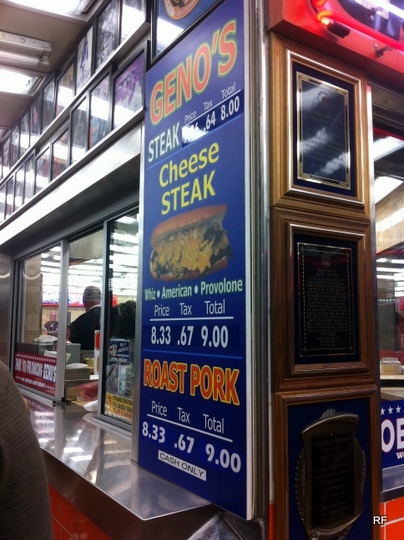 Geno’s, clearly going for the Shock & Awe campaign. Nice & simple. 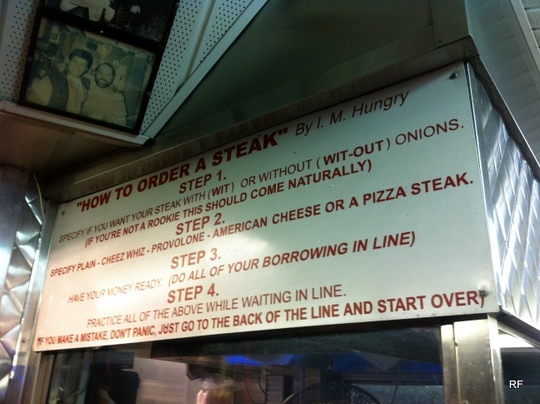 Tourists want the cheesesteak. I assume locals (if hypothetically locals ate here) go for the roast pork. As you can see, there isn’t that much meat for a $9 sandwich. 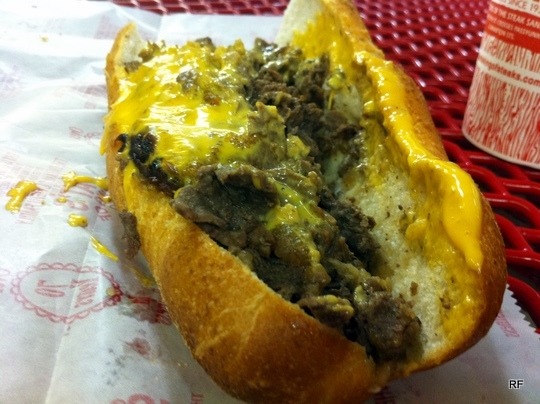 The cheese (whiz) shines with a high cheese to meat ratio. 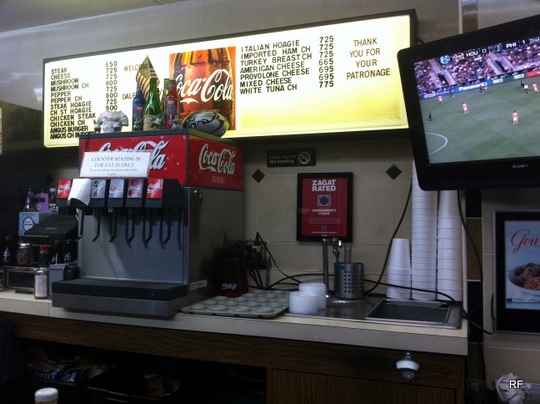 Pat’s offers a lot more options on the menu. I found it unnecessary, but I guess it allows customers to get it their way. Pizza Steak? Fish Cake? What?? 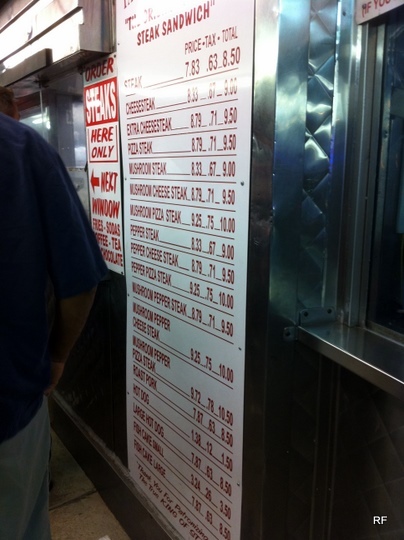 Pat’s obviously offers substantially more meat than Geno’s. 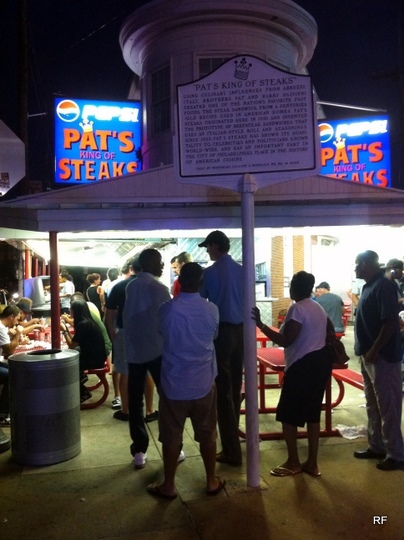 Here, I’d point out that the line for Pat’s was noticeably longer too. 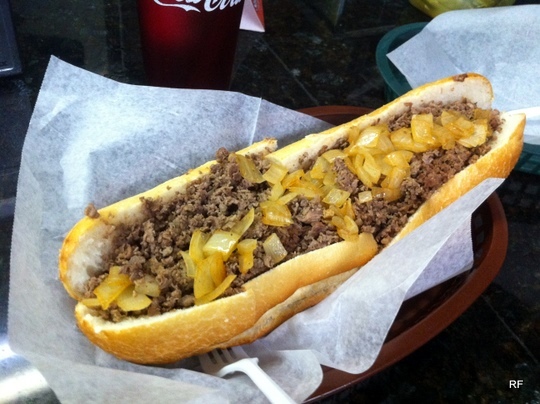 At both places, I got with onions and cheese whiz. I didn’t get fries because it would fill me up too much. Keep reading to see why I had to preserve stomach space. Since Philly is a two hour drive from NYC, I made an executive decision to hit up a third spot. 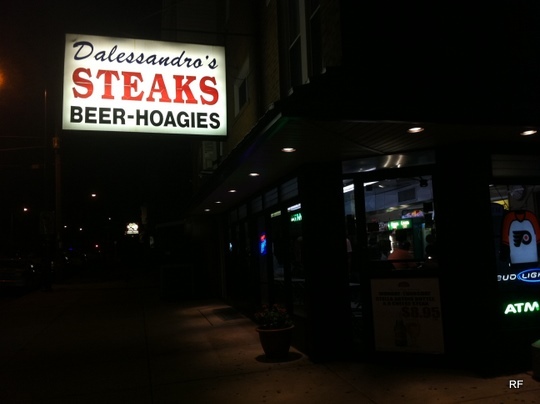 Thanks to Serious Eats, we hit up Dalessandro’s. 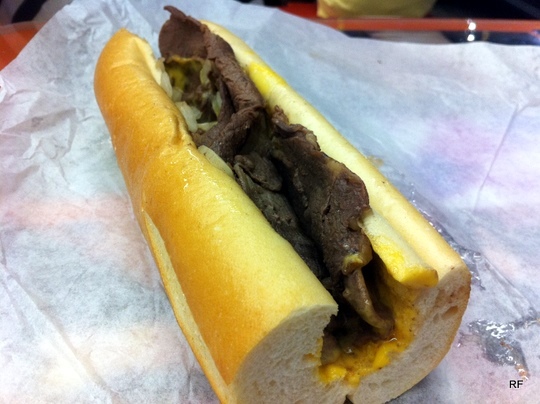 Cheaper than Geno’s and Pat’s (both $9 each), this $7.25 cheesesteak was amazing. 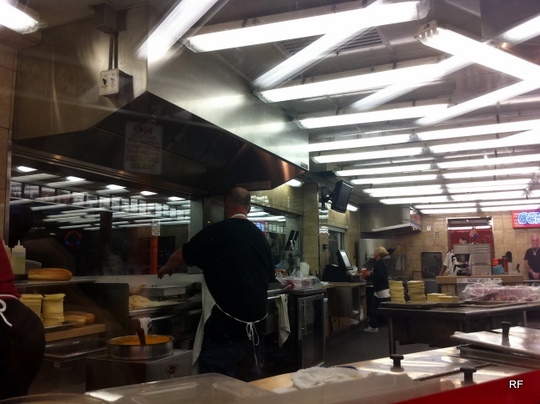 The cheese is mixed into the chopped steak (as opposed to topping the meat). 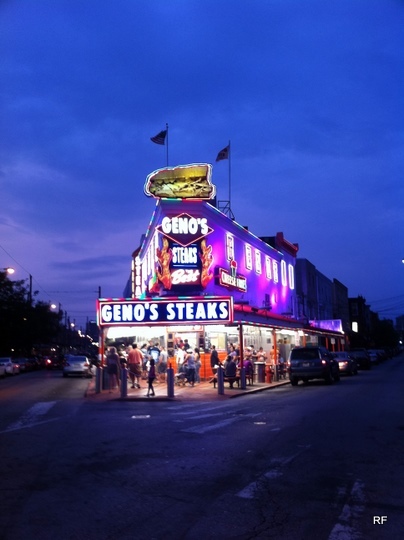 This entry was posted in Food and tagged cheese wiz, cheesesteak, Dalessandro's, geno's, menu, pa, pat's, philly, roast pork, steak on August 10, 2011 by Rex.